In the first six days after hostilities began in Iraq, the Pew Internet & American Life Project joined with the Pew Research Center for The People & The Press to survey Americans about their views about the conflict, how they were getting news about it, and the impact of developments on them. This report discusses how the Internet has grown as a news source for millions, how supporters and opponents of the war are using the Internet differently and how Americans are using email to debate, express concerns and show their patriotism. 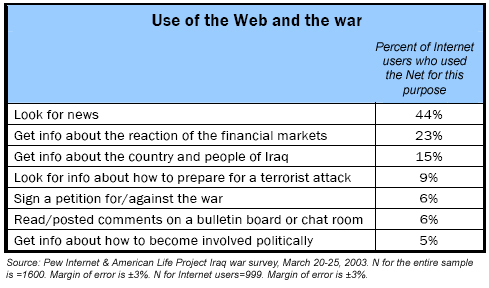 More than three-quarters of online Americans (77%) have used the Internet in connection with the war in Iraq. They are going online to get information about the war, to learn and share differing opinions about the conflict, to send and receive emails where they ponder events, express their views and offer prayers. In addition, a smaller portion of Internet users are using email to mobilize others and gain support for their views about the conflict. In all, 55% of the nation’s 116 million adult Internet users have used email in one way or another to communicate or learn about the war and 56% have used the Web to get news, general information, and commentary on countless Web sites that have war related material and argument. About one in seven Internet users (14%) say they are going online more because of the news. War opponents are slightly more likely than supporters to report intensified Internet use. For instance, they stayed online somewhat longer during a typical day in the early period of the war. The overwhelming majority of Internet users are using TV to get most of their war news. In fact, of all the major forms of media, the Internet is last on the list of ways that online Americans are getting most of their news. 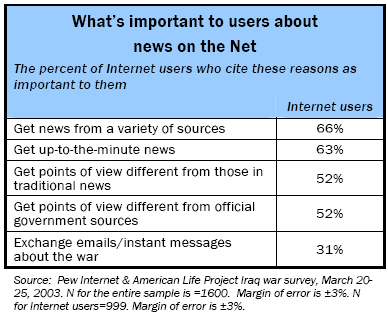 Still, 17% of online Americans say their principal source of information about the war is the Internet and that number is considerably higher than when we asked questions about how Americans were getting their news immediately after the 9/11 terror attacks. At that time, only 3% of online Americans said the Internet was their primary source of information about the attacks on the World Trade Center towers and the Pentagon and the aftermath of the attack. In the immediate pre-war period, Internet users were even more likely to say they were relying on the Internet for news about the situation in Iraq. Some 26% of online Americans said the Internet was their primary source of news and information about the possibility of war with Iraq. Further, more people in our pre-war sample said their use of the Internet was keeping them abreast of breaking news developments, was helping them form their views about the war, and helping them promote their views about the impending conflict. In addition, the size of the online news audience has jumped dramatically beginning in the period just before the war began on March 19 and in the immediate days after hostilities were started. On each of the five days after the war began on March 19, more than 33% of U.S. Internet users went online to get news. And online news interest was even higher in the days immediately before the war broke out: 37% of online Americans were getting news on a typical day. This is a substantial increase from the usual online news audience; we have previously found that 24%-26% of Internet users got news on a typical day. It is also the first time in the three years of polling done by the Pew Internet & American Life Project that more than 30% of Internet users were gathering news online during a typical day. Men with Internet access are much more likely than online women to be getting news from the Web both before and after the war broke out. In addition, Internet veterans (those with more than six years of online experience) and broadband users are the most likely to be getting news online. Nearly half of broadband users are getting news online each day. At the same time, we do not see a diminishing of other online activity at the outset of the war. Typical Internet use has not changed – roughly the same number of U.S. Internet users are going online during a typical day, they are spending about the same amount of time online and they are doing other online activities at approximately the same rates. This is different from the period right after 9/11, when there were generally fewer people online on any given day and they were not nearly as likely to be doing online browsing for fun or shopping. In the days the war started, U.S. Internet users support the U.S. war effort by a 3-1 margin. Some 74% of Internet users back the U.S. war effort and 22% oppose it. 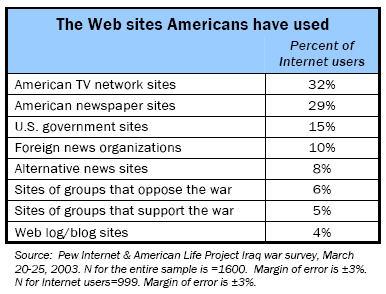 Internet users are more likely than non-users to support the war and to support the way President Bush is conducting the war. Internet users are also more likely than non-users to think that launching the war was the right decision and to think the war is going well. Further, online Americans are also more likely to believe that the press is doing a good job covering the war and to say they think the U.S. military is giving the public an accurate picture of how the war is going. At the same time, Internet users are a bit less apprehensive than non-users about several possible outcomes of the war, including the possibility of Iraq using weapons of mass destruction against U.S. troops, that there might be a lot of U.S. casualties, and that the general situation in the Middle East might deteriorate into all-out war. 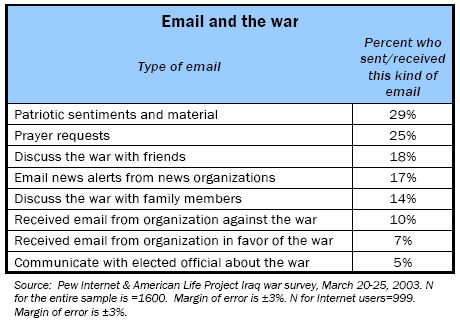 Fully 55% of online Americans have used email in connection with the war. (A full table of the activities we measured is below.) As a rule, the most fervent veteran Internet users (those who have high levels of education and income and several years of online experience) have been the ones most likely to send email of all kinds. Whites are somewhat more likely than minorities to use email for matters related to the war after the fighting broke out, but there were not notable differences between racial and ethnic groups in the pre-war period. Online men were more likely than women to use email to get news alerts. Online women were more likely than men to use email for prayer requests, to discuss the war with family members. In all, 56% of American Internet users have gone online for some kind of information and news about the war or to become involved in a more direct way. Many are using their Internet connections to keep abreast of war developments, perhaps because this is the most convenient way for them to catch up on headlines during the day or because they are not immediately able to turn on a TV or radio. 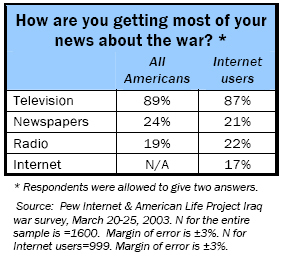 Some 45% of Internet users got news about the war in the initial days of the conflict. Reflecting our longstanding observation, online men were more likely than women to be news-seekers. Further, Internet users from upscale groups with high levels of education and income were more likely to seek news online than those with less income and lower levels of educational attainment. Broadband users were also much more likely than dial-up users to go online for information and news about the war. Some 70% of those with broadband connections used the Web for war-related searches, compared to 58% of dial-up users who used the Web for those purposes. Just as most Americans are getting their news from television, more Internet users are going to American television networks’ Web sites than any other news source online. Men, college graduates, and Internet users under the age of 65 are more likely to have looked at any of these news sources online. Internet users with six or more years of experience are significantly more likely to have done so, as are home broadband users. There has been much early discussion about the role of blogs or Web diaries in shaping opinion about the war and allowing Internet users to gain new perspectives and sources of information about the war. Our first soundings on the subject show that blogs are gaining a following among a small number of Internet users, but they are not yet a source of news and commentary for the majority of Internet users. Some 4% of online Americans report going to blogs for information and opinions. The overall number of blog users is so small that it is not possible to draw statistically meaningful conclusions about who uses blogs. The early data suggest that the most active Internet users, especially those with broadband connections are the most likely to have found blogs they like. In addition, blogs seem to be catching on with younger Internet users – those under age 30 – at a greater pace than with older Internet users. Variety and timeliness are the top two most important aspects of online news for U.S. Internet users. In general, younger Internet users are more likely than others to have favorable opinions about online news. Internet users with six or more years of experience are also significantly more likely than others to get news online, as are home broadband users. Online Americans appreciate their ability to use the Internet to keep up to date on events. More than two of every five U.S. Internet users (41%) say their use of the Internet helps them stay abreast of the news. The heaviest users of the Internet, especially those with broadband connections, are the most likely to appreciate the Internet for this reason. Younger Internet users – those under age 30 – are the most likely age group to cite that benefit. College graduates are also very likely to say the Internet helps them stay current with war developments. One in five Internet users (19%) say their use of the Internet has helped them shape their views on the war. War opponents are more likely than war supporters to say this. And longtime users of the Internet are more likely than relative newcomers to express this appreciation for the role of the Internet. Some 20% of online Americans say the Internet has helped them make their views about the war known to others. Again, war opponents are more likely than supporters to cite this benefit from going online. And the most fervent Internet users are more likely to say this than those who are less active online. Finally, 6% of all Internet users say something they learned online has changed their opinion about the war. The number is so small that there is no way to draw statistically significant conclusions from a closer examination of the group that said it had changed its mind based on information available on the Internet. It appears that more war opponents than supporters said that Internet information helped change their mind. Users who did not complete high school were more likely to be swayed than those with higher levels of education and younger Internet users were more likely than older users to say “yes” to this question. Towards the end of our survey, we asked respondents to compare the online news environment to that of newspapers and TV. Did they think that using the Internet gave them points of view that are not available in newspapers and TV? Even though a clear majority of Internet users say they value the online environment because they get a variety of points of view, just 17% of Internet users said going online gave them different points of view. Some 64% said the points of view online were pretty much the same as those in newspapers and TV. Fully 19% of the respondents did not express an opinion – a rate of non-response that is unusually high. This modest level of sentiment that the online world is different applied to even the most obvious Internet partisans. These are the same people, though, who frequently say the value of the Web is that they can find a variety of points of view. Just 21% of the most active Internet users – those who are online every day, those who have more than six years of online experience, and those with broadband connections – said the online environment exposed them to more points of view that other media. About a third (34%) of those who said they are relying most on the Internet for news said the Internet is different from traditional media. War opponents were somewhat more likely than supporters to believe the Internet gave them alternative points of view from those in traditional media.